Full sun to partial shade in late winter, partial shade in summer. Excellent. Snowdrops are hardy to -32C (-25F). Topdress with a balanced organic fertiliser in early spring, when new growth appears. Crocus. Snowdrops naturalise well in light shade, and can be grown in lawns that are not mowed until late spring. 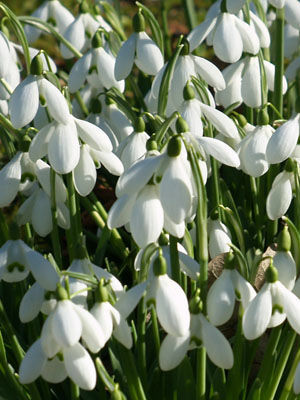 Snowdrops combine well with crocuses, scillas, and early-blooming daffodils. Set out dormant bulbs from late summer to early winter, planting them 3in (8cm) deep. Allow 10cm (4in) between bulbs. Over time they will fill in with seedlings and offsets. Like crocuses, snowdrops are considered harbingers of spring, often blooming before the last snow. Expect snowdrops to spread when planted in a hospitable spot. Seeds can be gathered and re-sown in early summer. Established clumps can be dug and moved in the autumn, but are best left undisturbed. Snowdrops need a period of winter chilling, and will not persist long in warmer areas.